Hi! I am moving here from March 2013 because I think we are looking at April now because FI sister will not be back in our state of AZ until then. Not sure of the date, but we are looking at 4-4-2013 because we want a Thursday and it has a nice ring to it. It may change later though. Anyway, my name is Amber, I got engaged 12-18-2011 and I am a budget bride, hoping to do it for $5000 or less for the wedding (plus about $1500 for the rings, tux and dress). I have started to look at venues, but haven't really done anything else. I hope we can all share ideas! 110 Invited! | 65 Have their dancing shoes ready! | 35 Don't wanna dance. | 10 Must still be looking for their dancing shoes! Congrats!!!! Welcome to the board, cant wait to share details as well! I am getting married the day after you! Thank you Congrats to you! What have you planned/ got done already? How did your FI propose? Do you guys have any pets? I have reserched venues and made a guest life (it's not final yet). I still haven't even toured the venues! I have lot's of work to do!! My FI made a DVD with a picture slideshow of us with all of the pictures we have taken together with the song "Marry Me" by Train as the soundtrack to the video, and sat me on the couch at home and played that DVD, popped out a ring and asked! We have a Black Lab mix named Bella. That is SO cute! You should play that at the wedding! Engagement story: Last April my family, FI and I were on a vacation in Marco Island, FL. After dinner one night, everyone wanted to go outside on the dock and watch the sunset; but my mom wanted to do the dishes so I stayed inside to help her. Throughout the week there were dolphins swimming through the canal and my dad ran inside to tell us they were back and to hurry or we will miss them. So we are sprinting outside and I am looking and I don't see anything. I was totally thinking to myself 'good job guys, you got mom to come outside and hang out!!' Then I heard someone tell me to turn around. I look, and Steve is down on one knee with a box in his hand. That is where everything got blurry for me. I started to hyperventilate lol and cry hysterically! All I could hear was my mom and sister shouting "Is this really happening? Why didn't we know about it?!". It was amazing. At that point we had been together 6 years and while I was WAITING for this, I did not expect it at all. He proposed on 4-13-2011 and our wedding date is 4-13-13. :) haha geez my story is so long! 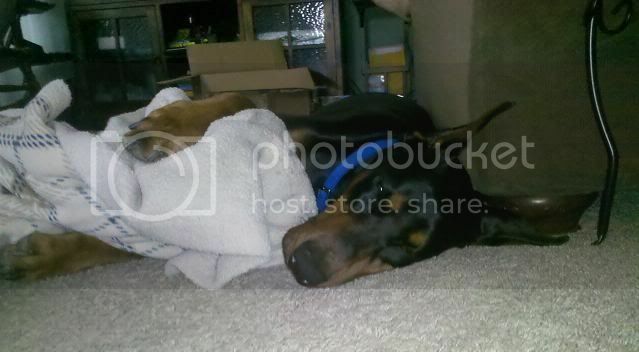 I still am living at home so the pup in my pic is our family doberman, Jack! Do you have any pictures of Bella? We used to have a chocolate lab, and my FI is big into hunting and after we are marred he wants to get a lab to hunt with! Aw, so cute!!! I love hearing everyones engagement stories! Our story:: I had a really bad day at work came home and did not want to do anything, typical me I am very stubborn!! FI tried and tried to get me to go out because of what he had planned, but that did not happen. So we were in our pajamas, FI was getting something together in the other room and he called me in and he was down on one knee! of course after i said yes, made phone calls and then I wanted to go out! So we went out to dinner, and when we came home the room was set up with rose petals and candles. My mom and sister were waiting for us with champagne. His original plan was to go to dinner and come home and have it all set up and propose...but I wouldn't have had it anyother way! No pets yet, hopefully soon! I love hearing others engagement stories!!!! Unfortunately the night my fiance proposed I had a bad day at work, I came home not knowing he had anything planned got in my pj's and didn't want to go anywhere! I am sooo stubborn lol :) FI tried and tried to get me to go out, but i said no...so he was doing something in the other room and he called me in there he was down on one knee and of course I said yes! We made phone calls etc etc and then I wanted to go out!!! Little to my knowledge he had my sister in on it, even though she knew the first plan was out of the question, she still came over and did what FI asked her to set up. When we got home from dinner, my mom and my sister were there with champagne. There were rose petals and candles everywhere! I wouldn't have had it any other way!! As far as pets, we did have one and just had to put her down So we decided to wait to get another puppy..hopefully after we get married and have a house. are the boards being slow today??? i was having major issues and posted my story once, it didnt show and i posted it again! now i am seeing both of my posts i deleted the first one lol ..
[QUOTE]I love hearing others engagement stories!!!! Unfortunately the night my fiance proposed I had a bad day at work, I came home not knowing he had anything planned got in my pj's and didn't want to go anywhere! I am sooo stubborn lol :):) FI tried and tried to get me to go out, but i said no...so he was doing something in the other room and he called me in there he was down on one knee and of course I said yes! We made phone calls etc etc and then I wanted to go out!!! Little to my knowledge he had my sister in on it, even though she knew the first plan was out of the question, she still came over and did what FI asked her to set up. When we got home from dinner, my mom and my sister were there with champagne. There were rose petals and candles everywhere! :) I wouldn't have had it any other way!! As far as pets, we did have one and just had to put her down :( So we decided to wait to get another puppy..hopefully after we get married and have a house. are the boards being slow today??? i was having major issues and posted my story once, it didnt show and i posted it again! now i am seeing both of my posts i deleted the first one lol ..
Yep, it ate my post too, now it's back! Thanks about Bella being adorable. I'm happy to meet you girls!